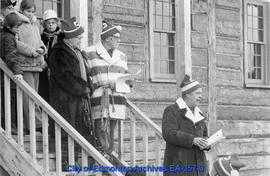 Honorary Chief Factors of Fort Edmonton, includes Christina McKnight, Richard Y. Secord and Merrill Wolfe. 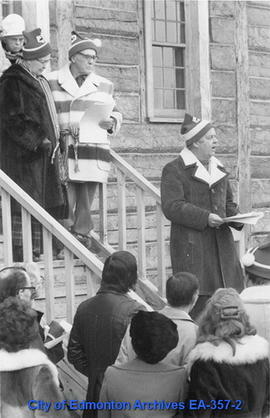 Honorary Chief Factor of Fort Edmonton, includes Christina McKnight, Richard Y. Secord and Merrill Wolfe. Honorary Chief Factors of Fort Edmonton, includes Christina McKnight and Richard Y. Secord. Gay Nineties Fashion Show. L.H. White and Mrs. F.H. Richards. Women's Page: Fashions from the past. Women's Page: Fashions from the past. Model Irene Greenwod in turn of the century dress. Women's Page: Fashions from the past. Model Jody Day in twenties dress. Women's Page: Fashions from the past. Model June Carlson.